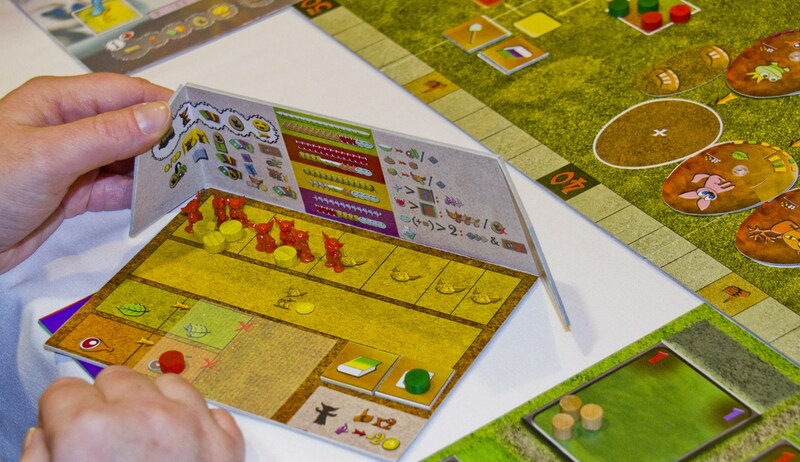 The Czech Republic has quickly become the center of board game innovation in recent years. With the ascendancy of Czech Games Edition and with a diverse array of games being designed by one Vladimir or another, there seems to always be something to look forward to coming out of Germany’s neighbor to the east. The best part is that there’s something for just about everyone. Whether you’re a fan of civilization games, cooperative games, adventure games, party games, auction games, or various other genres, the Czechs have something for you. In just five years in the market, CGE has built an impressive portfolio to rival a number of more longstanding publishers. But you’re not here to hear about what’s come before. We’re not a hobby that dwells on the past, but rather one that looks ever to the future. I was fortunate enough to recently try out five Czech prototypes and am back from the horizon to tell you about what’s ahead. Please keep in mind while reading the descriptions and viewing the photographs below that all of these games are prototypes and not final. That means that the gameplay may change and that the photographs are of rough playtest copies. None of the artwork for these games is finished so the final products will not look anything like what you see below. I still thought it would be useful to share a few photos to help you visualize what the games involve, but you should look at them with this cautionary note in mind. Of the five games I’m going to describe, four are designed by Vlaada Chvatil and one by Vladimir Suchy. Four of them will be published by CGE and one of them by WizKids. All of them are expected to be available in 2011, with all but one of them likely being Essen releases and one potentially being a summer release. They’re all very different and I thought all interesting, so without any further pontificating or warning I’ll launch into the matter at hand. First up is Dungeon Petz by Vlaada Chvatil, which will be published by CGE at Essen 2011. I’m sure the title immediately brings to mind the 2009 release Dungeon Lords, which is certainly intended. Dungeon Petz is set in the same world as Dungeon Lords, although in this sequel of sorts the imps have escaped from the dungeon and have setup competing pet shops. Each player will control a group of imps that is trying to earn points by raising troublesome pets, caring for the pets as they age, showing them in competitions, and selling them to buyers. 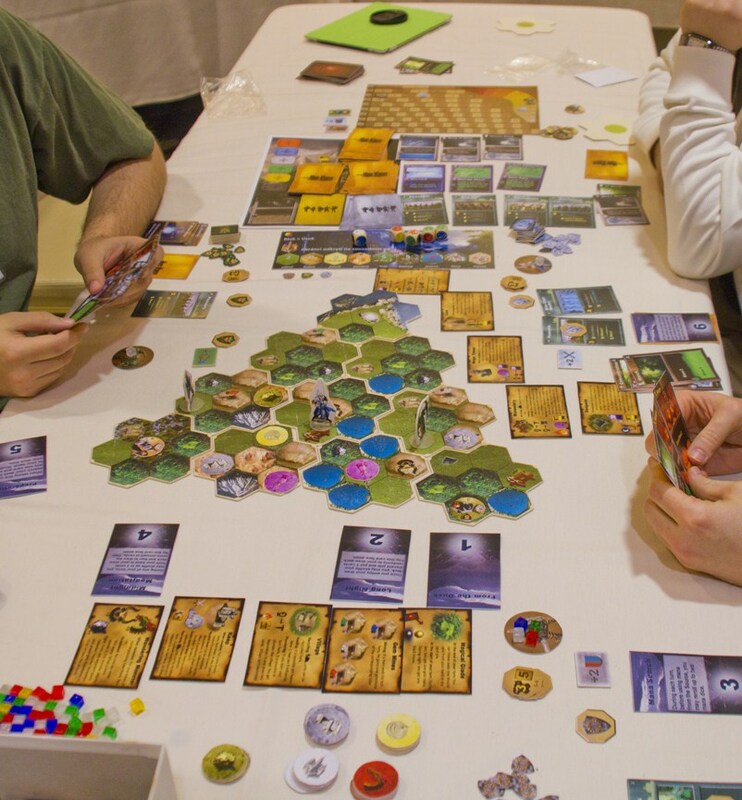 The core mechanic of the game is a modified worker placement concept whereby the players start each round by secretly and simultaneously grouping their imps into groups of various sizes. Then everyone reveals their groups and places them into worker placement spots in order of the size of the group. So essentially you can place fewer workers earlier in turn order or more workers later in turn order, depending on how eager you are for certain actions. You can also use gold, which is a one time expendable resource, to increase the size of a group for turn order purposes. As you may be able to see from the photo on the right, there are two central boards and each player has two individual boards as well. 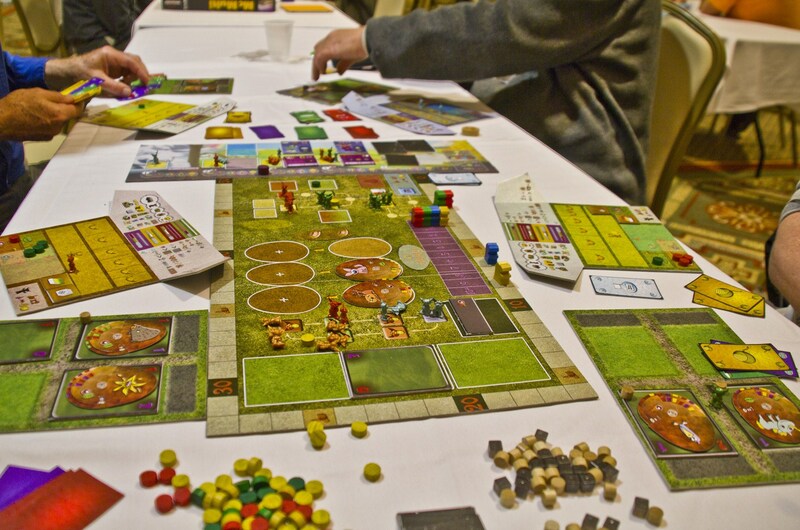 On the primary central board are the various action spots, each of which can be claimed by one player per round (as in Caylus, Agricola, and the like). The score is also tracked on the outer edge of the primary central board. On the secondary central board (toward the top of the photo), the players track the progress of the rounds and phases (like in Dungeon Lords). On the secondary central board there are also extra worker imps that players can claim. Finally, on the secondary central board, there are tiles that flip up over the course of the game to show players what factors will be judged in each round’s “beauty” contest and what factors will influence each buyer in terms of points awarded. These flip up in advance like the blue event tiles in Dungeon Lords. Then there are the two individual player boards. On the one depicted to the right, players can flip up a screen during the secret/simultaneous part as they arrange their imps/gold into groups. This board is also where you store your extra gold and the food for your pets (vegetables and meat). As an aside, some pets are carnivores, some are herbivores, and some are omnivores, with these traits making the pets slightly different to care for and worth different values as a result. This board is also where you store your special item tiles. Finally, this board shows on the flip-up screen (from left to right): all of the rounds/phases, the card deck distribution, and the consequences of failing to satisfy your pets’ various needs. This can lead to things like suffering cubes, mutation, imp death, and even your pet being sent away to a nice farm in the country. The second individual player board, visible in the bottom left and bottom right of the wider angle photo up above, is used for storing your personal cages, cage improvements, and pets. The numbers on the cages represent physical strength and magical strength, which are needed to contain different types of pets. In the actual game, I believe the cages will be depicted more thematically to represent things like swimming pools and other things that match up to their strength statistics. The pets themselves for now are depicted on dials that you rotate as the pet ages. This shows that the pet’s value increases over time whenever you ultimately choose to sell it, but also the pet’s needs increase and the pet becomes more demanding as it ages. The needs of each pet are handled in a very clever way I thought. There are four types of needs categorized by color: yellow, red, purple, and green. A pet need of a given color makes you draw a card from that color deck each round and makes you spend a card of that color on the pet each round. When you spend a card on a pet, it generally makes the pet do something that you need to deal with or suffer the consequences. For instance, the yellow cards most frequently make the pet want play time, which means you need to either have a cage that satisfies play time or need to have saved a leftover imp to allocate to play with the pet. The green cards most frequently make the pet want to eat, which means you need to have grabbed the appropriate type of food with an action earlier in the round or the pet will get a suffering cube. As you might imagine, it’s not good to get many of those. I suppose I should take a step back and talk a little more about the structure of the game. It is played over some number of rounds that I don’t think is finalized (possibly around 6), with each round being broken down into a handful of phases (let’s say perhaps 5). 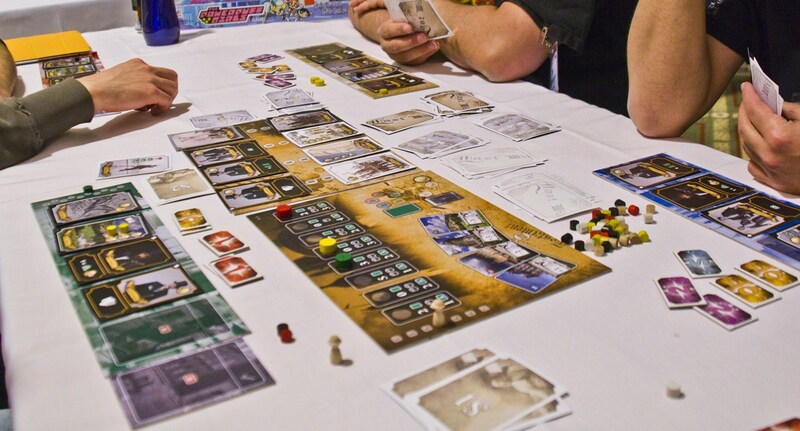 At the beginning of each round, players get some gold, then allocate their imps/gold into groups, then reveal and place their worker groups onto the various action spaces on the board. These spaces let you get things like pets, cages, cage improvements, meat, vegetables, potions (essentially wild cards for the pet caring phase), heal wounded imps, bonus points to use later during the “beauty” contests, and other special items. Sometimes you’ll want one particular thing really badly and group your imps in fewer, larger groups and other times you won’t be as interested in what’s available and may just go for more action spaces later in the round. It’s a fairly flexible system and you can obviously go anywhere in between on that spectrum. Lastly, I’ll explain that the “beauty” contests each round allow you to show off your pets and be judged on various characteristics to earn points. The buyers also evaluate your pets based on a variety of qualities and then give you points and money. Timing when to get pets and when to sell them seems like one of the keys to the game. It is interesting how some contests and buyers value aggressiveness, while others value playfulness, and other pet traits. Some contests or buyers penalize you for various things too, like your pet being hungry. As the description probably sounds, the game is a bit zany. I would say it’s silly, but it’s actually a rather involved and strategic game. I don’t think it’s quite as heavy or complicated as Dungeon Lords, but it’s not a light game despite its theme and tone. I thought there were definitely interesting decisions to be made in the game, but did find my first play a bit frustrating as it can be a punishing game. It seems somewhat easy to be overwhelmed by your pets demands and there is the possibility of getting demoralized if your pets don’t survive or sell for very little. This is a game that will really benefit from being played a few times to get a handle on all of the numerous things that demand your attention throughout. Last Will, designed by Vladimir Suchy, will also be published by CGE at Essen 2011. I actually had the chance to play Last Will three times and have to say it is one that I particularly enjoyed. I thought that Shipyard was pretty good and that 20th Century was very good, but Last Will shows that Suchy is both versatile and improving constantly. The basic premise of Last Will is that the players are all cousins whose wealthy uncle has passed away. He stockpiled money all his life and never took the time to spend and enjoy it. Therefore, he has left it in equal amounts to the players, who are now tasked by their uncle’s last will and testament to spend and enjoy the money as quickly as possible. The player who runs out of money first wins. In all of my games so far, multiple players ran out of money on the same round, so the winner was the person who managed to go furthest below zero. As you may be able to tell from the photo to the right (where yours truly is fiddling with my opponent’s board), Last Will is a card-driven game where there is a central board and individual player boards as well. The cards are how players spend money, by playing cards like carriage ride, theatre, dinner, and the like, all of which cost money. It is strange at first to reorient your thinking to trying to spend as much money as quickly as possible, but you get into the spirit of the game remarkably quickly. The cards are also rather thematic with people like a “thieving waiter” or a real estate agent (with some negative adjective that I can’t quite recall) being useful to help part you from your money more quickly. The game is played over the course of up to 7 rounds. Theoretically if 7 rounds ended and no one had run out of money then the game would end and the person with the least money would win. In all three of my games, multiple people ran out of money in round 5 or round 6, so the tiebreaker mentioned above came into play. In each round, you start by dealing out face up cards to the various slots on the board (with a different quantity depending on the player count). The distribution of which cards are dealt out changes from round to round so cards that make sense earlier in the game are more widely available at the beginning. There are five decks of cards – properties, white single use cards, black permanent cards, special cards, and the supporting cards (i.e., horse, chef, dog, and guest). Next, in clockwise order (with start player rotating from round to round), the players select a space from the options on the central board (one per player). You may be able to see these spaces in the photo on the right, where the red, yellow, and green markers are. This decision is one of the most difficult and interesting of the game actually. These spaces dictate how many cards you get to draw (from the tops of any of the decks that aren’t the special deck), how many workers you get to place, how many actions you get to perform, and the turn order for the rest of the round. As soon as you pick a spot, then you draw cards. Once everyone has selected a space, then turn order goes from left to right on the board (not clockwise for the remainder of the round). So if you reorient the board, you will see that green would get to go first, followed by yellow, then red. This turn order is crucial because the next thing that happens is that players go around placing their workers on the various spots on the board in turn order. These spots allow you to claim a given face up card, modify the housing market (more on that in a moment), spend a couple dollars, or gain an extra space in your play area to store permanent black cards. Once everyone has placed their workers to do these various things, then in turn order, the players execute their allotted number of actions, which may just be one or could go up to four or more. An action is generally to play a card from your hand or to sell a property. You could play a single-use white card to spend some money at a restaurant, at the theater, etc. You could play a permanent black card to your board that will help you spend money faster in various ways, like the aforementioned thieving waiter that will make your meals more expensive. Lastly, you could play a property to your board. This is where things really get interesting. Properties are expensive cards that allow you to spend a lot of money. They also cost money to maintain each round or they depreciate in value if you don’t maintain them. One of the key rules of the game though is that you are not allowed to go below zero dollars if you own any property. Therefore, you must sell all of your property before trying to go below zero and win the game. However, when you sell a property, you gain money equal to its value. This is the only way in the game that I can think of where you gain money. Gaining money is bad. Obviously (or not so obviously at first), depreciating your properties is great so they will sell for less, but then again, spending money to maintain your properties is also good. The real trick of Last Will seems to be to blow through almost all of your money quickly with properties, and then setup some way to get rid of the last bit of your money after you sell your properties because the problem is that properties are a great money sink, but once you sell them, you get money and have lost your best method of spending it. I saw some players execute clever strategies of selling off multiple properties in a wave over a couple rounds, which seemed to work well, but also was difficult to time right so that you bump against zero dollars and then shoot below it right after selling your last property. The single-use white cards also seemed useful for this purpose in the late game. That’s probably too much detail into the strategy of the game though as it’s obviously still a prototype and may change significantly before its release. I just thought that a brief discussion on that element of the game might help illuminate what it’s all about and what kind of decision-making is involved. I really thought that this was a clever game. While it was somewhat solitaire, it was also fairly quick and there was a constant pressure of knowing that your opponents were blowing through their cash and about to run out of money. So even if there’s not a ton of interaction, there’s this feeling of racing against your opponents to spend as fast as possible that made it feel engaging and competitive. Mage Knight is designed by Vlaada Chvatil and will be published by WizKids, likely at Essen 2011. I gather the title will be familiar to some of you because the source material is based on a pre-existing licensed property, but I am unfamiliar with any prior Mage Knight universe. Mage Knight is an adventure game along the lines of Runebound or Chvatil’s earlier Prophecy. It is a game for people who are not adverse to a high degree of complexity, a fairly long playing time, and rolling dice. It’s also a game for people who can get into the theme of exploring terrain with your hero and fighting monsters. Mage Knight is a scenario-driven game that will allow players to work through a number of different scenarios with slightly different rules or goals for each. I believe the game is for 2 to 4 players; I tested it with just 2 players which I thought worked rather well. As you can see from the photo on the right, there is a lot going on in Mage Knight. It is a board game with an expanding board as you move your figure around to explore new terrain. But it is also a card game where players will have a deck and hand of cards that control play. In fact – I hesitate to call it this because it might give the wrong impression – it’s a bit of a deck-building game. However, it’s much further from the Dominion-Thunderstone-Ascension-Nightfall line of games than has become the norm in the last couple years. 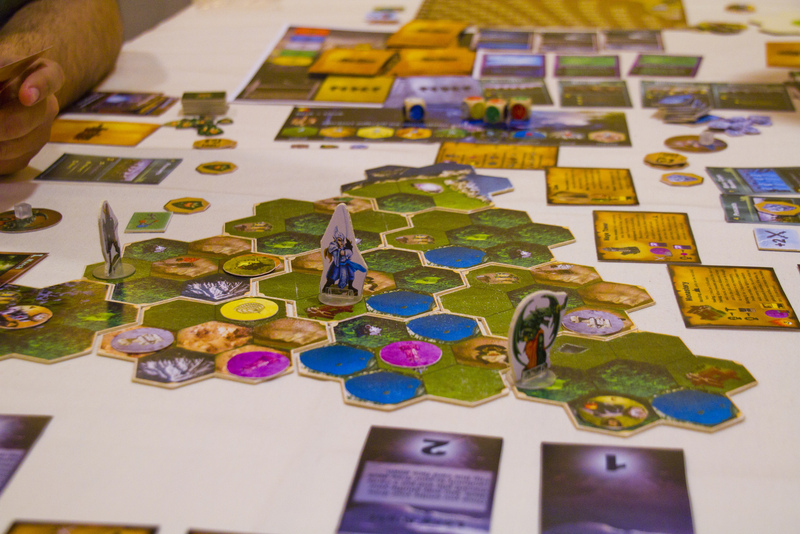 Mage Knight is played over the course of a given number of day and night rounds. Players are trying to earn the most fame by the end of the game by doing heroic deeds like slaying monsters. Players each start the game with a deck of around 25 cards or so. It is a larger starting deck than is normal for a deck-building game. There is also a lot less shuffling. Each player has a unique hero that has a slightly different starting deck and somewhat different abilities. You draw five cards into your hand and play as many cards as you want on your turn to do things like move around on the map, fight monsters, and recruit mercenaries. After your turn you draw back up to five cards. The round ends after any one player’s deck runs out and everyone else gets one final turn. This is clever because it allows you to decide whether to burn through your deck quickly or to proceed more deliberately. This works because cards give you a certain action listed on them, like 4 movement points or 2 attack points. However, you can use any card as a wild worth 1 point of any action. This simple rule makes for interesting decisions about whether to conserve your cards and use them more effectively for their listed action, or to rush through your cards to do exactly what you want to do but less efficiently. This will also depend in great part on what your fellow players do, which could devolve into a bit of a group think issue, so you may want to mix up your opponents to see different approaches. So as I was saying, on your turn you play as many cards as you want to move around and fight monsters. As you can see in the photo on the right, the map is made up of different terrain as you might expect, which can hinder your movement plans. The destinations are things like towns, monasteries, caves, towers, and the like. In the towns you can find mercenaries that you can recruit to join you on your roaming quest. In most of the other locations you can find monsters to fight, which will earn you fame, which is the whole point after all. One nice mechanic is that fame is not simply an abstract point track, but also indicates when you “level up” during the game by reaching certain fame thresholds, which gives you new special abilities or cards. The combat system for fighting monsters is fairly straightforward. First you get to attack with any ranged attacks that you have, then the monster attacks you if it’s still alive, and finally you get to attack with melee attacks. When you take damage it is in the form of useless wound cards that go into your deck; no surprise there. I gather you can also fight your fellow players although I didn’t see that happen in my game so I’m not certain of how it works. I believe it allows you to push them away on the map and put their figure in an annoying location. I said it was like a deck-building game; you might be wondering what I meant. Basically, you can acquire new spells or artifacts in towns or various other locations that go into your deck. These actually go on top of your deck for you to use next turn. The reason it doesn’t feel like a traditional (can that adjective be used to describe such a new genre?) deck-builder is that you shuffle your deck only a few times and you only add a handful of cards to your deck over the course of the game. You’re not getting a ton of cards or shuffling constantly. You only shuffle after each day or night round, which is probably only a handful of times in the whole couple hours, depending on the scenario. There is one last interesting mechanic that I should mention which is mana. At the beginning of the round, players roll a common pool of mana dice that show various colors. Each turn, players can take one mana die and use its color to boost one of their cards played. Most (maybe all, I can’t recall) cards have a normal effect and a super effect if boosted with a particular mana color. After your turn you re-roll the die you used and add it back into the mana pool. There is one side of the die that is useless and essentially removes the die from the pool for the rest of that round. Some cards also allow you to “crystalize” mana which gives you a gem of that color and lets you save the mana for use on a later turn. So that is Mage Knight in a very cursory nutshell. It is probably the most intricate game discussed here so it is the one game that I feel I really can’t do justice to in a quick overview. I thought it showed a lot of potential, but was also clearly a work in progress. There was so much going on that it was impossible to entirely wrap my head around in this initial play. I have a feeling that fans of adventure games will enjoy this one, and another feeling that this will help cement Vlaada’s reputation as one of the most, if not the most, versatile designer(s). If nothing else, Mage Knight is absolutely nothing like Dungeon Petz above or the two games discussed below. Vlaada is also working on a second expansion to Galaxy Trucker that is currently untitled as far as I know. It’s another “BIG” expansion, although perhaps not quite as big as “the” big expansion. This second Galaxy Trucker expansion will be published by CGE at Essen 2011. I should mention up front that I am a HUGE fan of Galaxy Trucker! I love that game so much. I have played it a ton and consider it one of my all-time favorites. I say this to warn you that my feelings about a second expansion to Galaxy Trucker are completely 100% biased. I will fawn and gush over anything GT-related; it cannot be helped. That being said, let me try to objectively describe what this expansion will add. To summarize: more tiles, more cards, more boards, more evil, more awesome! To the right you can see Vlaada himself explaining what the new tiles do to an unsuspecting victim. You should have seen Vlaada laugh maniacally as our ships fell apart from the new terrors that he has introduced into the game. He definitely delighted in our ships falling apart, as did we of course. I am normally pretty good at this game, but finished my first time through with only 3 points after all four rounds (yes, 4 rounds now!). I’ve now played this second expansion prototype three more times and am doing better, but those boarding parties are still pretty vicious (yes, boarding parties!). A word of warning though, this is not an expansion for the faint of heart or new players to Galaxy Trucker. This is really for experienced players or people who don’t mind – or preferably enjoy – when things go to hell in a hand-basket, or I suppose in a hastily cobbled together spaceship. 1) Robots: These count as 4 people for certain cards, like combat zone and abandoned station, but cost a battery to activate. 2) Solar Panels: These provide a free battery input per card to an adjacent battery-consuming tile. 3) Wires: These are like pipes that help you connect lots of stuff, except adjacency travels through wires. That means that everything adjacent to a Wires tiles is considered adjacent to each other. This would be pretty useless in the base game, but with both expansions and all of the new tiles that depend on adjacency, wires can be used to very nice effect. 4) Stuff with indestructible plating on it: This time around there are things like crew cabins, batteries, and cargo holds with indestructible plating – very nice! You’re gonna need it, although it won’t help you against the new internal threats of course. 5) Thrusters: These are awesome! They cost a battery to use and allow you to shift your ship in a given direction to change which row or column an asteroid or cannon fire hits you at. Like engines, you can’t have adjacent tiles in the line of fire of thrusters. Also, the direction you can shift depends on which way you orient the thruster tile. These can be very handy for changing where you get hit. 6) Turret: This provides you with 0.5 laser strength and kills a boarding party if it walks over the turret. I’ll explain boarding parties when I get to the new cards below. 7) Armory: This needs to be adjacent to a crew cabin and provides weaponry to any adjacent crew. Those crew are now armed so they kill any boarding party that walks into them. I did not have enough turrets and armories in my first few ships with this expansion; that was very bad! Cards: The second thing that the expansion adds is new cards. First, it adds a card to each round that actually makes you immediately add to the top of the deck two cards from the next higher round number. So, for instance, you could end up with a couple round 3 cards during your round 2 flight – not nice! Second, it adds a few boarding party cards to each round. These are the biggest and best addition in the expansion. Boarding parties attack everyone from a given direction and you roll to determine the row or column. Then the boarding party marches around each person’s ship a given number of spaces, following the connectors, and bearing either left or right depending on the card. There are two types of boarding parties: one that walks X spaces and then blows up the tile it is standing on, and one that walks X spaces and eats all of your crew, batteries, and goods that it passes. Both are very nasty! The only way to kill them and get the listed reward (goods or points) is if they walk through a turret or armed crew. You need to get really good at spacing out your defenses well to maximize the chances of boarding parties walking into your defenses. It’s frustrating when a boarding party manages to just skirt by and avoid your defenses, destroying as it goes. Boards: There are new round 2, round 3, and round 4 boards, which are awesome as awesome can be. First, there is a new round 2 board that is wide but not very tall. You are meant to envision that the ship is a wrap-around cylinder, so the left and right sides are connected. This means that you need to make sure that your connections match up on the far left and far right edges. This is useful though because the ship is not very thick and is particularly liable to break in half. Another trait of the new round 2 ship is that every column is equally likely to be hit by any given die roll because Vlaada has changed it so it’s not 7 hits one column and 3 hits another, but rather that each column is assigned a couple dice pairs, so the odds are the same for every column. Second, the new round 3 board is the “Swiss Cheese” Board. The board is covered with a smattering of numbers in the spaces throughout the ship. There are five instances of each number from 1 through 6. At the beginning of the round you roll two dice and whatever numbers are rolled, those are the numbers that players cannot build on for that round. So if you roll 2 and 5, then you cannot build on any of the 2’s or any of the 5’s on the round 3 board. If you forget and do so, which is really easy to do, then those components fall off your ship at the beginning of the flight, which of course could cause lots of stuff to fall off. As you might be able to envision, this results in a very unstable swiss cheese ship that is prone to falling apart. I’ve seen people fly across the finish line in round 3 with a ship the size of a single crew cabin tile in this round; it’s not a friendly board. 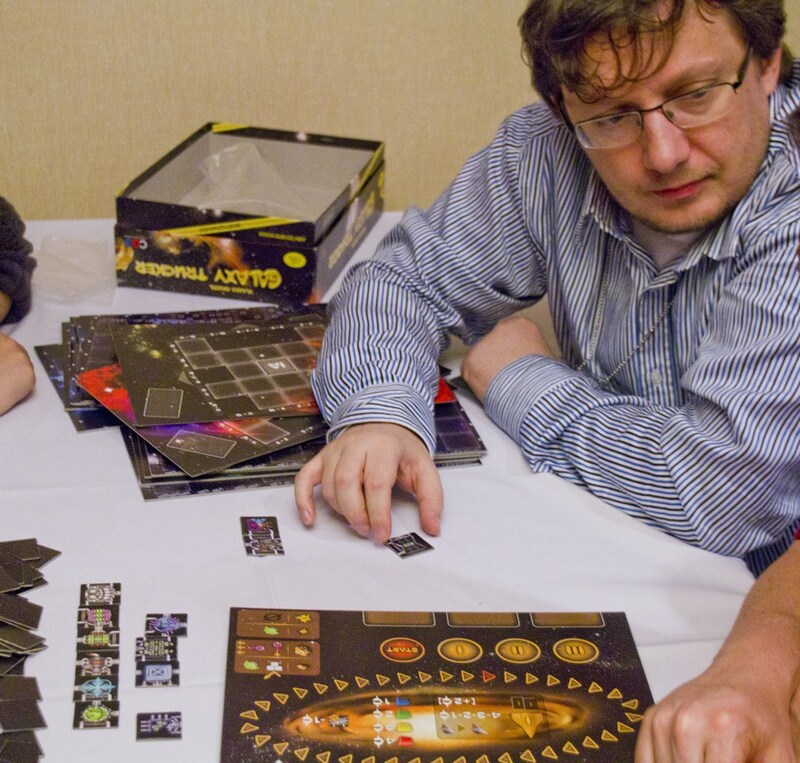 Third, as you can see in the photo on the right, there is a new round 4 where players build massive ships composed of two boards put together. You actually flip over the Swiss Cheese Board to get the top half of your round 4 ship, and you flip over the round 2 wrap-around board to get the bottom half of your round 4 ship. Every round 4 ship half is unique, making every combined round 4 ship unique. They are slightly different shapes and configurations, which is a neat touch. To go with a round 4 ship board, there are also of course new round 4 cards. I’m sure I don’t have to tell you but the round 4 cards are nasty. Not only do the pirates shoot you, but also the smugglers and slavers now. All of the rows on the round 4 combat zone involve getting shot, no more merely losing flight days or goods. Even the abandoned stations shoot at you if you land on them. There are also new large meteors that are trailed by a small meteor that automatically hits you in the same row or column as the large meteor, sneaky and mean! One friendly thing is that there are extra crew to pick up on some of the round 4 planets. Of course the boarding parties are extra mean though, marching many more spaces wreaking havoc in your ship and even a boarding party that forks, splitting up with one going left and the other going right. Double trouble! In addition to the new tiles, cards, and boards, there are new special powers. After each round, you lay out a bunch of special power cards and players each select one in the order they finished the race. Anyone who didn’t finish the previous race gets a random special power card. You get a new special power card after each race, but also keep your previous ones, so you accumulate a bunch of special powers over the course of the game. The special powers were the one part of the game that was still most being worked on I believe, so I won’t go into detail about what they might do. But I’ll say that they let you break the ship building rules in various ways, like perhaps connecting a single to a double connector, or putting a laser or engine inside your ship. They also do various other things, but basically it’s a wide mix of abilities available. They’re interesting because they add an element that sticks with players from round to round. I think that’s it. As you might have been able to glean from my subtle hints, I love this expansion! I think Galaxy Trucker is fantastic, but it’s most fantastic when your ship falls apart. Sadly that stops happening once you play the base game enough, and it even stops happening once you play the first expansion enough. The rough road and evil machinations cards help, but the second expansion really helps. I imagine some day I could be able to regularly survive these new horrors, but for now I think it will breathe a good deal of welcome new life into a fabulous game. As I said at the top, there are more tiles, more cards, more boards, more evil, and more awesome! Lastly, but certainly not least, is a drawing game by Vlaada that will be published by CGE. This is the one that I mentioned at the top which might be published before Essen, possibly as early as this summer I believe. Pictomania is like Telestrations, but better. 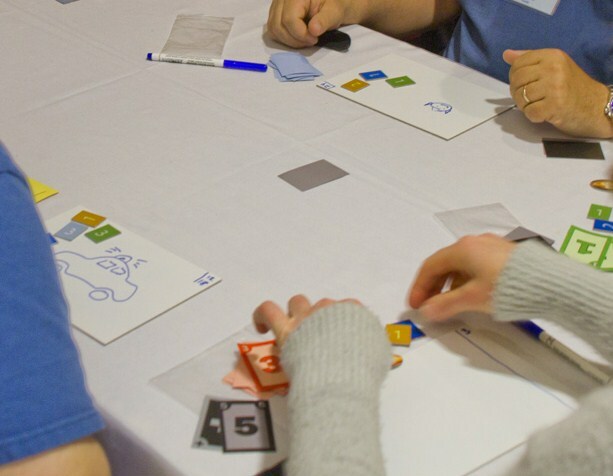 Pictomania is similarly a drawing game (for up to 6 players) where each player gets a white board and a dry erase marker, and players have to both draw given things and guess what their follow players are drawing. It is a wonderful forum for showcasing my terrible drawing abilities. This is probably the most pointless game to show a photo of a prototype, but I’ve never been one to shy away from pointless things, so on the right you can see a mostly useless photo of Pictomania being played. So let me try to explain how Pictomania is played, which may be a little tricky despite how simple a game it is. Basically, Pictomania is played over some number of rounds. At the start of each round, every player is secretly dealt a card with a symbol on it and a card with a number on it. Then the players insert around 6 or so cards into stand up displays so that everyone can see them. These cards each have a numbered list of items on them, which center around a theme (e.g., animals, holidays). The cards in the stand up display are positioned above a symbol. So your secret symbol and number pair of cards that you received earlier indicates a particular item that you are tasked with drawing. I hope that makes sense; it’s really very simple in practice. Now, everyone simultaneously starts drawing their assigned item on their individual white board. You want to draw your assigned item as clearly as possible because you want others to guess it correctly. You also want to be looking around and figuring out what other people are drawing at the same time. You have cards of your player color ranging from 1 to 7. Any time during this simultaneous frenzy, you can take a break from drawing, to put numbered cards by other players’ boards to guess what they’re drawing. You don’t have to guess which symbol (i.e., which card) they’re drawing from, just the number item they’re drawing. For example, on the card in the triangle slot there might be various animals listed, and on the card in the circle slot there might be various holidays listed. You just need to guess that another player is drawing item #2 or item #6 or what have you, and it is presumed that you are figuring the right list/card. At any time during the round, you can drop out and stop drawing/guessing. To do so you grab a numbered token from the center of the table, which will be worth bonus points during scoring (like the new Mondo). Once a few players have grabbed all of the available tokens and dropped out, then everyone else must stop drawing and guessing. Now the clever scoring system comes into play. Each player evaluates the accuracy of everyone who guessed at what they were drawing. Each player has a couple of scoring tiles in their color of various values. For the first correct guess of what you were drawing, you give your highest scoring tile to that player. The first correct guess is the card closest to the table in the stack of guesses, of course. For the second correct guess, you give your next highest scoring tile. You want to be giving away your scoring tiles because any of your own color scoring tiles that you don’t give away count as negative points against you that round. Once everyone has scored the guesses of what they were drawing, each person tallies their score, which is positive the value of the scoring tiles they received from opponents (i.e., correct guesses you made), minus the value of your own scoring tiles that you didn’t manage to give away (i.e., if you draw poorly). Lastly, you can get a couple bonus points from dropping out of the drawing/guessing early and grabbing one of those tiles from the center that I mentioned earlier. Then everyone gets their guessing cards and scoring tiles back and you do it again. You get a new, secret, random symbol and number card to tell you what to draw. Players also put a new batch of list cards in the stand-up display. One good part about the game is that there are different decks of item cards of varying difficulty levels. There are easy cards where the items are all fairly different, medium cards, and hard cards where the items are remarkably similar (like elk, moose, caribou), which makes the drawing and guessing much more challenging. After some number of rounds, where perhaps you increase the difficulty over time, players sum their scores from each round to determine the overall winner. Although the winner is really not the issue here of course. Then again, unlike Telestrations, the scoring actually makes sense in Pictomania and is rather clever, so I think it will be much more likely that players take the time to score the game to see the results. Pictomania is really a very simple and intuitive drawing game. I have a feeling that this explanation makes it sound more confusing than it really is, but hopefully I’ve managed to convey the essence of it. I need to thank Petr Murmak for providing all of the photographs above and for allowing me to share the details on all of these prototypes with anyone who has managed to read all the way through this thing. I hope that people have managed to muddle through my descriptions of these prototypes and have gotten a sense of the Czech things to come. There’s a lot to look forward to coming from Vlaada and Vladimir, with obviously a lot of help from Petr as well. The CGE gang just keeps plugging away and pumping out innovation after innovation. Given the diversity of the five games discussed above, I can’t imagine all of them will be any one person’s cup of tea, but there’s got to be at least one or two things in there for everyone. I hope this preview has helped shed some light on these upcoming games and helped you find the right game or games for you. Dale Yu – Well of the 5, I only managed to play Last Will – though I played it three times, and I really do like that one. There is still a bit of work that needs to be done to the game in balancing the cards and the number of actions – but I believe Petr and the rest of the CGE team are already doing that, and I’m sure that they will continue this during the spring and summer. I really liked the engine building aspect, and the risk-reward nature of the buildings is fun to deal with – you can build buildings which will help you quickly spend money, but you then have to sell them (and get money back) before you can be totally broke. Brewster’s Millions – the Czech board game is looking like a hit! I watched a good portion of a Mage Knight game, and while it certainly looked like an interesting take on the adventure-style games, that’s something that I usually shy away from these days. Reports from my brother and others that tried it were definitely positive. I will say that I am continually amazed by the different types of games that Vlaada Chvatil is able to devise! The same sentiment goes for Pictomania – it might actually be one of those rare party games that I’ll play. Of course, I haven’t done so yet, but I’m looking forward to trying it when it comes out! Sadly I never got a chance to try Dungeon Petz (sorry Petr!) – there always seemed to be people waiting to play the game, and I was never free at the same time as the prototype! Larry Levy – Got to play Dungeon Petz, Last Will, and Pictomania and liked all three of them, particularly Dungeon Petz. It has a nice thematic tie-in to Dungeon Lords, as the “petz” that the players are raising are actually the monsters that the dungeon lords will buy to stock their dungeons. The gameplay is involved and challenging, but a bit less so than Dungeon Lords, which isn’t necessarily a bad thing. I fully intend on snapping it up the moment it becomes available. I can see the other two games doing well in my group as well. 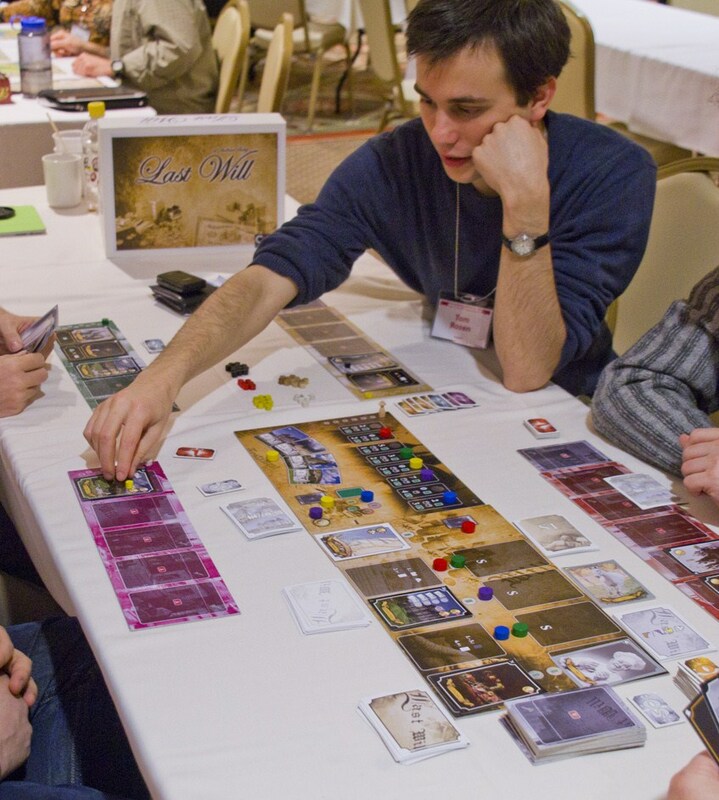 Greg Schloesser – Since I generally go to great lengths to avoid playing prototypes, I did succumb to the positive buzz and play Last Will. I’m very happy I did, as I found the game to be quite intriguing, clever, original and fast. No moaning about theme here; how many games have a “Your rich uncle has died, so spend all of his money as fast as you can!” theme? This is an engine-building game, a genre at which I generally perform abysmally. However, this one offers a wide variety of options, so you never feel truly hosed on a turn. Another benefit is that it is fast, playing to completion in under an hour. I am very excited about this one and look forward to its upcoming release. This entry was posted in First Impressions and tagged CGE. Bookmark the permalink. Terrific previews! Last Will and the Galaxy Trucker expansion will be must buys for me. Dungeon Petz looks pretty cool, but I’ll have to see how well it plays with only 2 players. Haven’t tried Dungeon Lords, but I’ve heard good things. 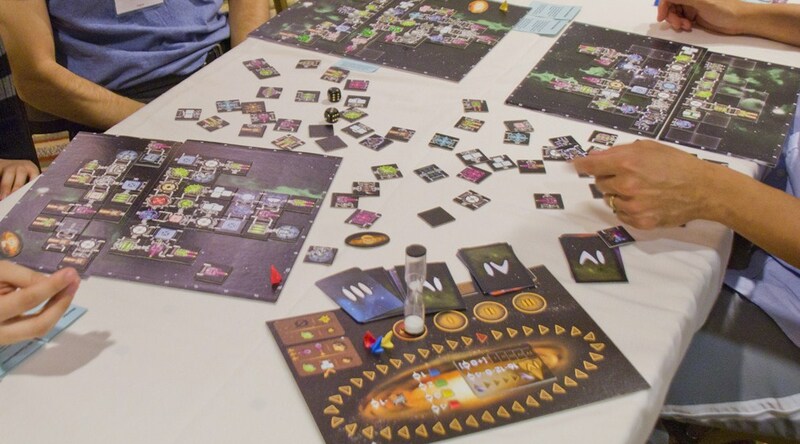 Can’t wait for Galaxy Trucker expansion…sounds like it adds so much more gaming goodness to the game! Thanks for the previews, Tom. The Galaxy Trucker expansion sounds great. Last Will reminds me of Go For Broke, which I used to enjoy as a kid and still think has a fun theme. It’ll be nice to have a game with that theme which plays well too. You’ve sold me on Last Will.